Bulgaria has formally launched of mass production of cars under the Chinese Great Wall badge by Litex Motors near the northern city of Lovech. The car manufacturing plant near Lovech comes to life seventeen years after Bulgaria's last failed attempt to revive its automobile industry. The first car of the Chinese company Great Wall assembled near Bulgaria's Lovech was rolled out in the middle of November 2011. With the opening of its new plant in Bulgaria, Great Wall Motors becomes the first Chinese automaker to assemble cars in the European Union. The joint factory of Litex Motors, a Bulgarian company, and Great Wall, located at the village of Bahovitsa near Lovech was launched Tuesday, February 21, in the presence of Bulgarian Prime Minister Boyko Borisov and China's Ambassador to Bulgaria Guo Yezhou, as well as Ms. Wang Feng Ying, General Manager and Executive Director of Great Wall Motor Co.
"Yes, we are all glad that Bulgaria will be producing cars. The investments have come from our friends. We've talked to the Prime Minister of China, and I received promises for the investment of 1 B until the end of 2013," Borisov stated at the opening of the plant of Litex Motors and Great Wall near Lovech. He further noted he was glad that Chinese cars for the European market will be produced in Bulgaria. "There is no way I can't be happy that I am the Economy Minister in a moment when the car manufacturing in Bulgaria is restored. Thank you for this emotion," said Traicho Traikov, Bulgaria's Minister of Economy, Energy, and Tourism. He emphasized his hopes that the Great Wall Motors project will turn out to be a boost for the Chinese investments in Bulgaria. 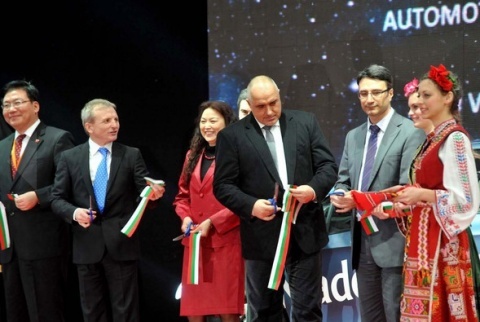 "It's no accident that th Bulgarian government provided BGN 2.4 M for the road to this factory, I hope this wonderful ceremony costs less," Traikov joked, referring to the infrastructure aid granted under Bulgaria's Investment Encouragement Act. Great Wall CEO Wang Feng Ying thanked the Bulgarian government for supporting the Litex Motors project, and declared that Bulgaria will be a starting point from which the Chinese car manufacturer will start entering the European markets. Cars produced by China's Great Wall already hit the Bulgarian market in October last year through a network of twelve representative show rooms across the country. Voleex C10 sedan, Hover H5 SUV and Steed pickup are the three different vehicle models, which Chinese car maker Great Wall Motor Co and Bulgarian company Litex Motors will produce in the town of Lovech, Northern Bulgaria, at very competitive prices. Expectations are for a furore not least because of the cars' low prices. Great Wall Motor Company, one of China's biggest automotive manufacturers, signed a joint venture (JV) deal with Bulgarian diversified holding company Litex Commerce in the presence of Chinese Vice President Xi Jinping and Bulgarian Prime Minister Boyko Borisov at the end of 2009. The plant will have an annual production capacity of 50,000 units and assemble four different models – a sports utility vehicle (SUV), a pickup and two passenger car models, which are expected to be sold in European Union countries. The total initial investment is around EUR 97 M, potentially reaching EUR 300 M if the project is successful. The Chinese company has secured 10% of the money, the remainder was forked out by Litex Motors, owned by petrol businessman and owner of Litex football club Grisha Ganchev. The cars are expected to be sold under the Great Wall badge, boosting the firm's output from around 400,000 at present. The project is considered to be nothing short of a coup for Bulgaria, which does not currently produce any passenger vehicles, though it does have a modest but successful automotive components industry. The plant will surely be positioned squarely towards export market and by the time production commences, the automobile market is expected to be experiencing a post-slump upswing. This may also be the last chance for the revival of the local automobile industry after in mid 1990s Rover set up a joint venture with the Bulgarian Daru Group in Varna, which failed because of a weak market strategy, high prices, and a stronger competitor in the face of Skoda.